Back on August 3rd, which is starting to sound like a long time ago, The New York Times featured a recipe for a Vietnamese Duck Salad. Since I rarely make Roast Duck It was tucked it away for future reference (we usually purchase Duck Breasts). One of our favorite resources, The Smokehouse of The Catskills, began carrying an organic free range duck from a farm in the Hudson Valley. That did it! Sunday we ducked out on Roast Duck. 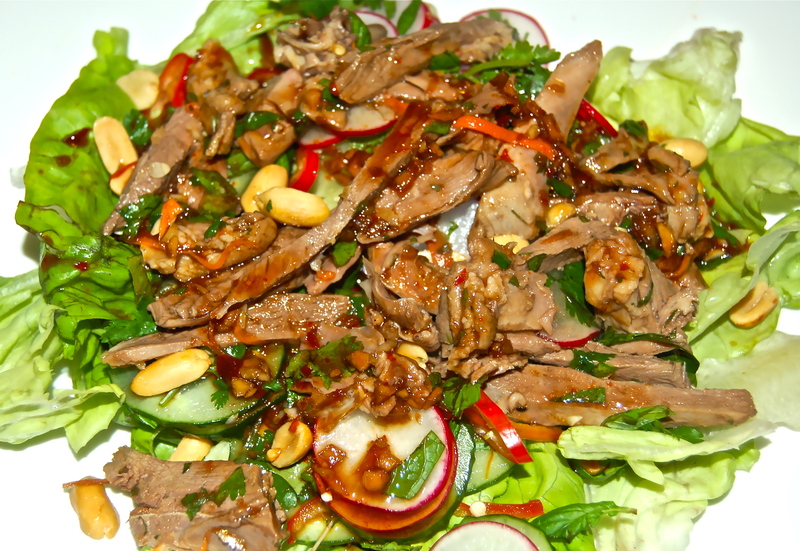 Last evening the leftovers morphed into a zesty Duck Salad in an adaption of the Times recipe. 1. Whisk together the Soy Sauce, juice and zest of 1 Lime, Ginger, Sesame Oil, Rice Wine Vinegar, Fish Sauce, Jalapeno(s) and Peanut Oil. Mash the Garlic into a paste and whisk it into the Vinaigrette. 2. In a large bowl, toss together Cucumber, Radishes, Cilantro, Mint and 1 thinly sliced Jalapeno (optional) with just enough of the vinaigrette to lightly coat everything. Taste and season with Salt & Pepper as needed. Toss in the Peanuts. 3. Plate by placing the Salad on a bed of Bibb Lettuce, and top with the sliced Duck. Drizzle with more of the Vinaigrette, and sprinkle with Cilantro and Mint.